To begin you will need to preheat the oven to 375 degrees. Next you will need to chop your vegetables and herbs. Next place a sauce pan over medium/high heat and add the oil. Once the pan is hot, add the onions and garlic. Cook until the onions are soft and translucent. Now you can add the quinoa. To the quinoa and onions add the water. Add 1 tsp. of salt to the quinoa. Bring to a boil, lower to a simmer, cover, and cook for 20 min. Now you can place the beans, tomatoes, corn, cilantro chili powder, cumin, and 3/4 the can of black olives into a large mixing bowl. Once the quinoa is finished, you can add it to the bowl as well. Now you can add the Enchilada sauce. Top with the grated cheese and the rest of the black olives. And place into a 375 degree oven for 30 minutes. Look at that beauty! You would never guess it was healthy for you! Simply scoop it out onto your plate, top with a little fresh cilantro, and you are ready to go! It is absolutely delicious and so filling that not even my King of the Carnivores husband missed the meat. In fact, he went in for THIRDS! 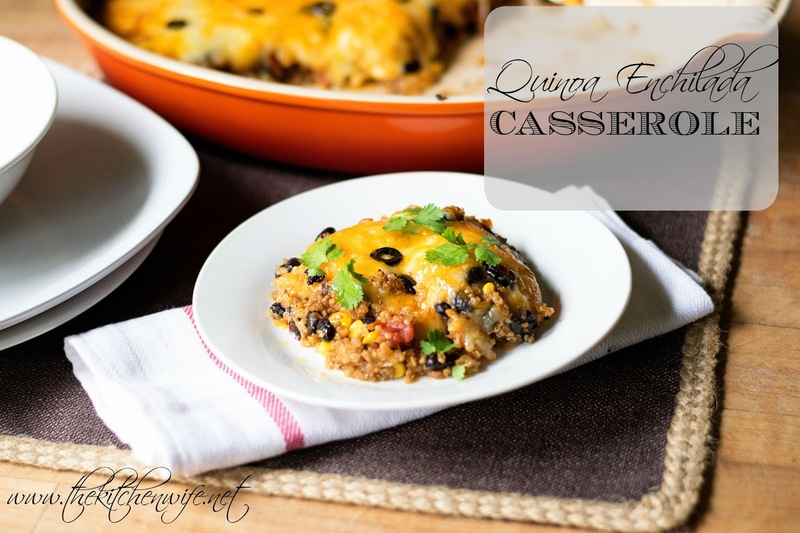 So if you are trying to find more vegetarian options for your menu, give this Quinoa Enchilada Casserole a try! You will be so happy you did! If you have any delicious vegetarian recipes you enjoy I would LOVE to hear about them! Place a sauce pan over medium high heat and add the oil. When pan is hot, add the garlic and onions. Cook until the onions are soft and translucent. Add the quinoa to the pan along with the water. Add 1 tsp of salt and bring to a boil. Lower to a simmer, cover, and cook for 20 minutes. In a mixing bowl add the tomatoes, black beans, corn, 2/3 can of the olives, cilantro, cumin, and chili powder. When the quinoa is finished add it to the bowl along with the enchilada sauce. Stir everything together and place into a greased baking dish. Top with the cheese and the remaining olives. Top with some fresh cilantro. Thank you for this recipe. 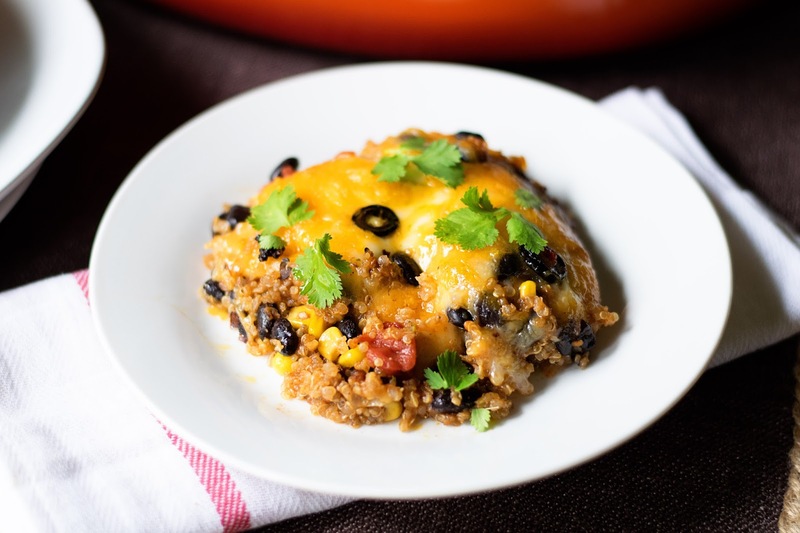 I love quinoa and Mexican food so look forward to trying this recipe. We are the opposite and try to eat a couple of meat recipes a week because I am not a big meat eater (but my husband is!) I think anytime you try to cut back on it is a good thing as Martha would say!! Thank you! I can't wait to hear what you think!